When time allows during the spring auction season, I create highlight videos from some of my fundraising auctions. These videos are posted on the Red Apple Auctions Facebook page but you’ll only see those if you 1) use Facebook, and 2) have “liked” the Red Apple Auctions Facebook page. As not all readers are Facebookers, I thought it might be a good idea to share these on the blog too. It allows all auction planners to get ideas from some of the top notch events my clients produce. The video below showcases my favorite auction set-up: theater-style seating. When should you consider a theater-style auction set-up? Cocktail-style events are well-suited for this arrangement or a variation of it. If you have access to a real theater (for instance, performing arts nonprofits), this set-up is a natural for your event. If you have an particularly loud or unruly crowd, changing the event to this set-up will help control the crowd. If you are using a non-professional auctioneer, your volunteer auctioneer will find this an easier style to work. This reel was from a school auction. They had a Wizard of Oz theme. 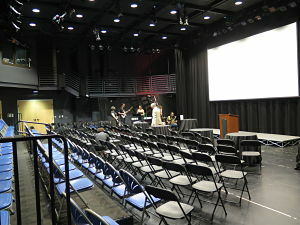 The school has a performing arts facility on campus and used it for the live auction portion of the evening. You’ll see that at the beginning of the video. The silent auction was held two floors up, in the library.